U.S.S. Enterprise, keel laid down in 2288, launched 2293 and commissioned stardate 9715.5 at San Francisco orbital fleet yards. Gained instant notoriety after her first mission was to rescue the crews of the Robert Fox and Lakul. The Robert Fox was lost with all hands but some of the Lakul crew were saved, as well as the Enterprise, through the heroic sacrifice of legendary Starfleet Captain James T. Kirk. Enterprise is commanded by Captain John Harriman, a youthful and talented Starfleet officer formerly from the starship Hunley. 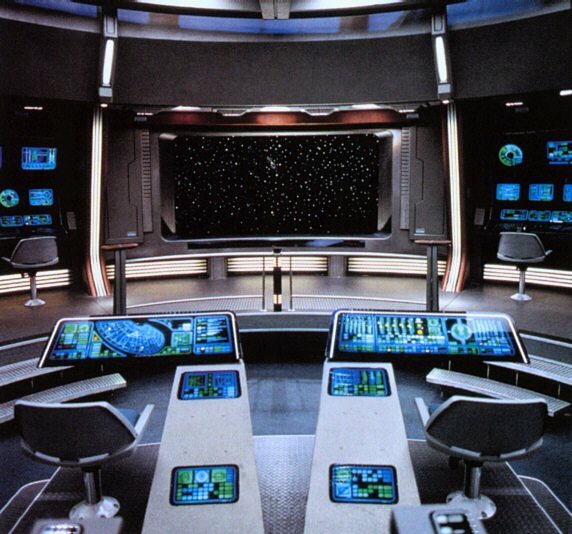 Enterprise has a crew of 510, ranging in experience from Captain Sulu to cadets on their first starship assignment. Commander Tracy Dane is the First Officer of the Enterprise. Enterprise 1701-B is one of the two flagships of the Starfleet and gets used for a large number of high profile missions, 'showing the flag' for the Federation. U.S.S. Enterprise has some of the finest Starfleet personnel onboard as her crew, some would go as far as to argue that they are the finest crew currently in the Starfleet, representing New Starfleet and the New Generation of Federation exploration. The Enterprise-B is the public relations starship of the Federation. The public face for the last thirty years was James T. Kirk and the aging crew of the starship Enterprise 1701 and 1701-A. 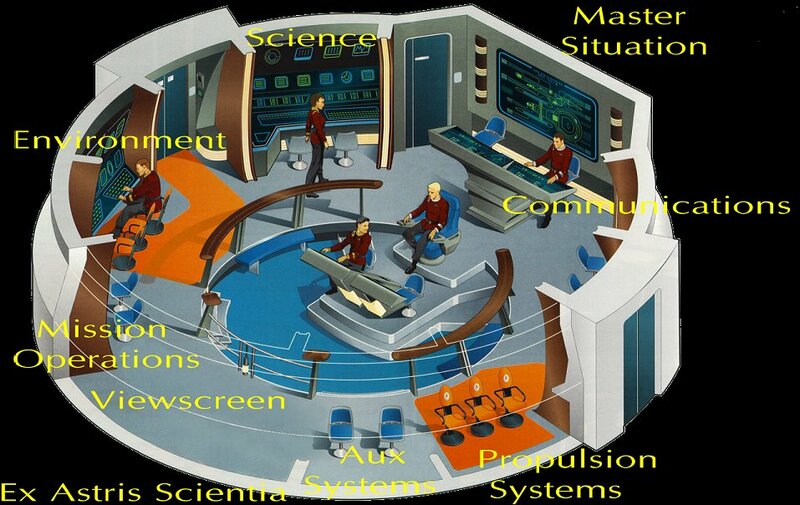 This image of an aging starship design and crew needed to be refreshed for the new Century. The first steps of the new Enterprise were faltering ones. Captain John Harriman, aged 34, was the son of Admiral John Jason "Blackjack" Harriman. The young Harriman had excelled at Starfleet Academy, graduating in an accelerated time of only three years. He had served on the U.S.S. Hunley and had his father's support in building up an impressive career. Starfleet felt that they had found their new James T. Kirk. When the new Kirk met the original legend, circumstances publically conspired to make him look weak and ineffectual. Kirk died to save the Enterprise one last time. The Enterprise was back in spacedock for nearly six months being repaired. Harriman had to contend with a crew with their faith shaken in him and the anger of a legend, in the form of Hikaru Sulu, when his daughter was apparently killed in one of their first missions out in 2294. Harriman had plenty of time to mull over the loss of Kirk under his command. The Enterprise was in refit for six months following the damage caused by the Lakul rescue in the Nexus. Harriman spent much of the time presiding over the repairs personally, making sure the ship was restored to a condition as good or better than at launch. The rest of the time, Harriman was in his Ready Room, assembling his crew for the mission ahead and debating over his own career. There's no secret that Harriman drafted his own letter of resignation; he spent many months returning to it, as he decided whether the public humiliation was the end of his career in Starfleet or not. The next decision was for a First Officer. A vital decision for any commanding officer so that someone trustworthy would be there as a sounding board, devil's advocate and the voice of the crew. Through an encounter with Leonard McCoy and General Choroth, Harriman found his feet once again. Captain Harriman wasn't to know,but his specialisation in the Romulan Star Empire at the Academy was to serve him well for the remaining time on the Enterprise. Commander Tracy Dane, distant relative of an American Civil War soldier, added the support to Harriman's command that he needed. The traditionalist First Officer was direct in her approach. Tracy Dane was born in 2261. She came from a long-line of military officers from those who served in the Union armies during the American Civil War right the way into Starfleet. As a result of her upbringing, she believed that Starfleet was a strict military organization and demanded military perfection from the crew of the Enterprise. Captain John Harriman handpicked her as his first officer over the offer of a Vulcan first officer. He believed he couldn't work well with an emotionally-restricted first officer. He found that Dane kept her emotions tightly in check. This led to arguments between the two in private, most notably, following the "death" of Ensign Demora Sulu following a rescue mission to Askalon V. Dane was to prove herself a loyal and capable First Officer for the five year mission from 2294 - 2299. In many ways, Dane represented the legacy of the Cold War Starfleet of the 70s and 80s and her time, like the militaristic mentality, was coming to an end. Starfleet was changing and she had to either change or move aside. Starfleet Command felt that the flagship of the Fleet ought to reflect the desired traits of Starfleet. Dane is a throwback character. By 2294 who would even care if you had relatives from a war 500 years beforehand? And the militaristic attitudes of Dane are not what New Starfleet is about. At all. If it were me, I'd pick an alien and a new kind not Vulcan. Say Deltan or Betazoid or Trill. This is the redemption of Captain John Harriman after his dreadful appearance in Star Trek: Generations. Alan Ruck cast as a bumbling commanding officer of an ill-equipped starship broke a golden rule for me: never make another character seem inept and hopeless in order to make your hero look good; Kirk is a legend and more than capable of looking epic in a scene without making Harriman out to be worse than a wet cadet in their first class. The novels, comics and graphic novels have Alan Ruck's captain still in charge of the Enterprise-B all the way up to the Tomed Incident in 2311. Eighteen years is more than long enough to redeem himself. Add to this a young crew that is forging the new Starfleet and a few Easter eggs like the son of Original Series villain Harry Mudd and you have the makings of the Star Trek series set after Star Trek VI. The character of Harriman is a vital one; Starfleet would have been shopping around by the early 2290s for the 'next Captain Kirk' since they knew Kirk would be retiring in 2293, there would be the first Enterprise in 28 years withot Kirk and his crew. They needed to find not just a good officer, bu he BEST officer in the Fleet to take on the job of commanding the new Flagship of the Fleet. So then we come to Generations. Alan Ruck is a good actor so the inept attitude and hopeless failings of Harriman come from a weak script. In the Interim Years we're dealing with the aftermath of Star Trek VI. I'd very much like to draw a line under Harriman in Generations and look at the competant, professional, skilled New-Starfleet captain that John Harriman will be. Harriman very much encapsulates the New Starfleet image and is the youth and hope for future Starfleet that the aging Sulu on the Excelsior just can't be. Both Star Trek and Starfleet need to start afresh for this era and Harriman with the Enterprise-B is that way forward. What is needed is a youthful, diverse crew and a capable ship. You've got a universe too used to 'Cowboy Diplomacy' and doing things the Kirk Way by breaking or bending rules. It's time for Harriman to show a new way forward. Having been aboard the REAL Enterprise, HMS Enterprise H88 on 25 July 2018, I was very taken by the calm professionalism shown by the crew. The short voyage to the ammunition buoy was pre-briefed and executed calmly exactly as planned. Commander Harper told me that if everything was trained corrected, if he, the Captain, suddenly died it should almost go unnoticed. Having watched the XO and other crew on the Bridge - I saw what he meant. There is a cool, calm professionalism that Star Trek and Starfleet should both have. Harriman and the Enterprise-B should be that professional team, demonstrating the frontiersman ethic of Kirk was now refined with professional confidence. It cannot be stated enough for the importance of the Enterprise-B. It's the new flagship, it's the symbol of the Federation and Starfleet. After a very rocky start it has an image problem that needs to be repaired. THIS is the name associated with Starfleet, Excelsior was the prototype placeholder with the legendary captain from the old Enterprise-A crew. THIS is the new beginning. Moving former helmsman Lieutenant Commander Demora Sulu into the position of Executive Officer in 2300 gave Harriman a win-win situation: he had both the new Starfleet officer that Starfleet Command wanted and also a close friend that had served by his side for seven years. There was a shuffling of the senior staff as well as the natural attrition that promisions and retirement brought. Starfleet Command wanted the Enterprise-B to reflect the optimism and hope that the end of cold wars with the Romulans and Klingons should bring. After the destruction of Klingon base one-zero-one (los-pagh-los) and the exposing of treachery dating back to Khitomer, Starfleet was eager to have a flagship that could bring peace to the Beta Quadrant through diplomacy. Starting the peace process was something already done at Camp Khitomer 2293; what was hard was keeping the peace and building upon it into something more. The Klingons treated the Khitomer Accords as exactly what they are: a strategic arms reduction treaty (START), not a peace process. Whilst the Excelsior had done a vaiant effort in the early 2290s with Ambassador Spock, this was the legacy of the cold war. Change could only be achieved by changing the players involved. Ambassador Curzon Dax became involved with the Enterprise. What was needed was a representative who understood Klingons and how they worked. Whilst Spock was a good Starfleet officer for decades, he had much to learn about diplomacy. Following on from the Tomed Incident, Captain John Harriman relinquished his command to his once former helmsman and then Executive Officer Commander Demora Sulu. After 18 years honing her skills on the Enterprise, and her family legacy, it was fitting that she took over as Captain. Sulu had aided her former captain in putting the launch day failure and loss of legendary Captain James T. Kirk behind him to forge his own legacy as captain of the Enterprise. The Enterprise has been heavily involved in the first stages of diplomatic relations with the Klingons. As flagship of the Fleet, the Enterprise-B carried such dignitaries as the Klingon Chancellor Azetbur, various Federation Presidents, Ambassadors Spock, Sarek and Dax on various missions, as well as some legendary former crew of the Enterprise. With such a front row seat, there was no way that Demora Sulu couldn't pick up on the diplomatic and political aspects of the Federation. The crew of the Enterprise-B from 2294 - 2311 is shaped from the novel The Captain's Daughter by Peter David. Although the Haynes Manual on the U.S.S. Enterprise has Harriman replaced as Captain after Generations, I think this doesn't do justice to Harriman. It wasn't his fault the Enterprise-B wasn't ready. And I'm all for a story of redemption. That, and Alan Ruck is best recognised as the Captain of the Enterprise-B in all of the comics and graphic novel stories that have followed. Harriman had a tough career on the Enterprise-B going from the death of Kirk saving the Lakul to Askalon V and shooting Demora Sulu; Spock's visit in 2294, the Klingon battlecruiser Vengeance in the same year and Romulan spies in 2296; all leading up to Tholian and Romulan aggression in the late 2300s leading up to the Tomed Incident. The Enterprise-B was introduced in Star Trek: Generations. She is the first starship Enterprise to have a youthful, talented crew that represents the new generation of Starfleet. This is a contrast to the previous Enterprise-A that had a crew of older, veteran officers who were still in the same positions that they had held for over twenty years. For the Academy graduates in the late 2280s must have feared that there was no real place for them on the flagship of the fleet. As an example, Saavik was on the Enterprise 1701 as a student of Spock, giving an air that you could only be accepted as a student of one of the existing veteran crew. Peter Preston (nephew of Scotty) being the other notable example in Star Trek II and Valeris being in Star Trek VI as the apprentice to Spock - he even says in the film that he intends for her to replace him. Nepotism is rife in the Starfleet of the 2280s and early 90s. Director David Carson, either deliberately or by design, had a totally new, youthful crew. The only hint back to the old crew of the daughter of Hikaru Sulu, Demora. This character came onboard as George Takei did not want to have a cameo in which he has gone back to being helmsman. A move that was 100% right to me. Episodes from the never-written Star Trek: Excelsior series inspired by Flashback and The Undiscovered County: (A glimpse of what we sadly missed). 1.01 � Pilot Intro, Khitomer and aftermath. 1.02 � Fallout - Tuvok returns to Vulcan after the end of his 2 month Excelsior mission and ponders on his Starfleet career. With five years still to work, never has a mission ahead felt so long. Comparisons with classmate Valeris leads to discussing how their paths of logic diverged. 1.03 � Mudd junior � follow up to the never-written ST: Phase 2 episode Mudd & Son. 1.04 � Miracle Worker. The loss of the starship Jenolen leads Sulu to recall his last encounter with Scotty. 1.05 � Choroth Incident � Enterprise-B with McCoy en route to deal with a plague and stopped by a militant Klingon General. 1.06 � Art of Compromise � Sulu takes Ambassador Spock to meet Azetbur to restore relations. E-B is in refit after the Nexus. 1.07 - Captain�s Daughter � see novel. 1.08 � Freedom Agenda - Enterprise-B takes the Federation President to meet the Klingon Chancellor, for more talks on the Khitomer Accords, with a new policy that shocks the Empire. 1.09 - Ashes of Eden. Based on the novel. 2.01 � New Starfleet � a new C-in-C is assigned after the treachery of Androvar Drake. Stardate 10000. 2.02 � Ratification � the Khitomer Accords finally come into force and the countdown to the end of the Neutral Zone has begun. I see these �lost ST: Excelsior stories� as being the background to the Interim Years. These are the ships in the Federation News, but it�s missions like the Sheffield that are doing the real research in the background. The early era 2290 � 2298 are more the Excelsior with the experienced Old School Sulu; the later period 2298 � 2311 is more Enterprise-B with the then-experienced John Harriman. Lots of Klingon Diplomacy with new Ambassador Spock, veteran Sarek and Curzon Dax. The steady dismantling of the Neutral Zone and the �rogue Klingon� attacks. Enterprise-B feud with General Choroth, ex of IKS Vengeance and Sulu encountering Kang or Koloth (more akin to his DS9 persona). I have a story idea, homage to TOS, with �Mudd junior�. Perhaps following on from the Phase 2 episode never written called �Mudd and Son�. Yes, The Interim Years will effectively have a �never made Sulu and John Harriman� series running in the background. Might even knock up season 1 for a laugh. 2294 is the year that Harriman has to come to terms with the title of "the man who killed Captain Kirk". The truth is that Kirk always ran around like he was late for his own funeral and he gave his life to save others in the way he always would have. Harriman presides over six months of repairs of the Enterprise-B, mulling over his own career and whether or not to hand in a letter of resignation; can he live with his perceived mistakes? As I've stated elsewhere, Harriman is the embodiment of New Starfleet. He MUST have been the best of the best for the job, so his epic failure in ST: Generations just doesn't make sense. Poor scriptwriting so that the crew of the Enterprise-A can step in and save the day one last, last time. McCoy may have helped Harriman in the Vengeance Incident, but Harriman already had the skills to succeed. Unlike the Haynes Technical Manual, I'm not throwing out Harriman withthe bath water; he may have been on the Enterprise-B when Kirk disappeared, but he is still the Captain. We�ve a few bits we �know� already, with the Choroth Incident with the graphic novel and the Terajuni Incident. On the back of this we need the Excelsior, fresh from the latter, carrying Ambassador Spock, meeting with the Klingon Ambassador to calms the waters. The Enterprise-B is still in space-dock for months to repair the Nexus damage, so good old NCC-2000 is hauled out. ST: Excelsior (2000) would have dealt with similar issues that the Interim Years does: change. The Enterprise-B embodies the New Generation of Starfleet. A young, inexperienced Captain John Harriman and youthful junior crew exemplified by Demora Sulu, contrast with Old Guard XO Commander Tracy Dane, even between Hikaru Sulu and his daughter helmsman from the Enterprise-B. ST: Generations made Captain Kirk look good by making the new Captain of the Enterprise seem inept and helpless; as the next part of this debate goes, this is not the first or last time they do this. Making the New Generation look weak and wrong, to make the old guard 'Cowboy Diplomats' look good, correct and wise. The Interim Years version of the ST: EXC stories, featuring both of these Excelsior class starships, will have a more diverse crew. "The above artwork is � Star Trek Fact Files. All rights reserved"